New Year is near and it’s a good time to plan parties and dinners with your near and dear ones. Have you ever thought what would booking a taxi this New Year’s Eve(NYE) cost you? Well, booking transportation at the last minute will demand a lot more money. Well as per previous year’s figures, planning your transportations and hotel accommodations beforehand is the best idea. Unless you don’t want your expenses to be too heavy on your pocket. Booking a private transportation like Uber on prior basis is the best option since it also saves you from the danger of drink and drive. Since there will be a mayhem of people booking taxis on New Year’s Eve, the prices increase manifold. So, if you want to stay in your budget, make yourself aware of Surge Pricing. The demand for rides in a particular area is the key factor for deciding the surge pricing. An area with more demand than availability will always have higher surge prices and hence higher fare prices. “Surge pricing for any trip is based on the rider’s pickup location. While you may receive a ride request while your vehicle is in a surging area, your rider’s pickup location may not be surging. When you receive a pickup request from a surging area, the trip request screen displays the surge multiplier. 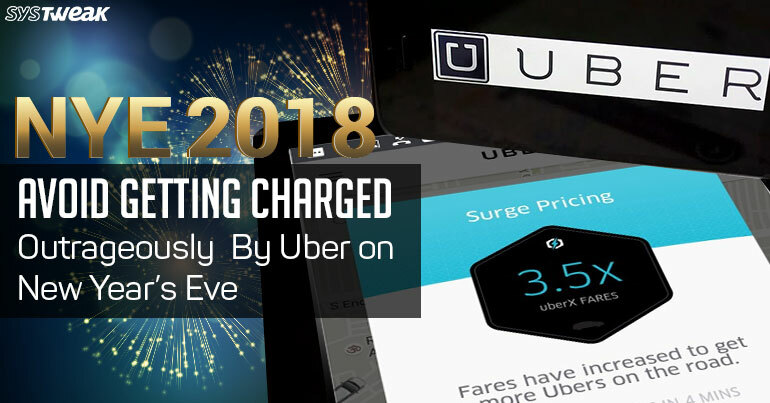 To avoid getting charged outrageously by Uber on New Year’s Eve, these points may help you cut down on your expenses this New Year’s Eve. Keep a close eye on the dynamic fare estimates. The Surge prices tend to be the maximum between the time frame of 12 AM to 3 AM. Try not to book cabs at this time as fares will be maximum in this duration. The chart given below shows how the prices are expected to vary on New Year’s Eve. It shows the variations in price in different time frames. Look out for other alternatives apart from Uber. Carpooling is a new trend nowadays, people who want to spend less on transportation prefer booking cabs in carpool. This means they will have to share their rides with other passengers and the tariff will be shared amongst all. It is definitely a good option considering the lesser amount of money you need to spend. It is however not a safe option where security is a concern. Keep these points in mind while booking any cab this New Year’s Eve. You do not know the people you are sharing your rides with. So, to avoid any such nuisance and to keep yourself safe while riding, avoid carpools is the safest option. In addition, be cautious while boarding any cab and ensure that license plate number on the app and that of the cab are same. You should also check the driver’s details such as his license and photo. For more information refer to the tips shared by Uber. This was all about Uber riders. Talking about Uber Drivers, NYE is prime time to make big bucks. Owing to the increasing graph of trip fares, drivers easily make hundreds of dollars this time. So, folks, avoid getting charged outrageously by Uber on New Year’s Eve. Keep in mind the points mentioned in the article and save yourself from spending extra this New Year.